Eggs! Eggs are a very all-round product: boiled eggs, fried eggs, scrambled eggs. You might need some eggs when baking a cake or a quiche and an egg is great to cheer up a salad. The possibilities are endless! Eggs are not only very all-round, they are also quite healthy and they fit perfectly into a conscious lifestyle. They are a great source for proteins and essential amino acids. They also provide several vitamins and minerals. Especially the proteins makes an egg a great product for eating after a though workout because your muscles will use the proteins to recover and gain strenght. You can have these ‘Deviled Eggs’ as a snack after your workout, but of course you can present them to your guests during a party! Boil the eggs until hard (about 8 minutes), hold under a cold running tap after cooking. This makes them easier to peel. Peel all the eggs and cut them in half. Remove the egg yolks, this goes very easy by using a teaspoon, and set aside the eggwhites. Add the egg yolks, mustard, honey/agave/maple syrup, sjalot/onion, curry powder, cayenne pepper and almond milk (water will work just as fine! It’s only to soften the yolks a bit so you’ll get a creamy filling for the eggs) to a kitchenaid or a mixing cup. Blend everything into a thick paste and taste! If you are satisfied with the taste you can scoop the paste into the halved eggwhites. You can do this by just using a spoon, like I did, or use a piping bag to get them look very pretty. 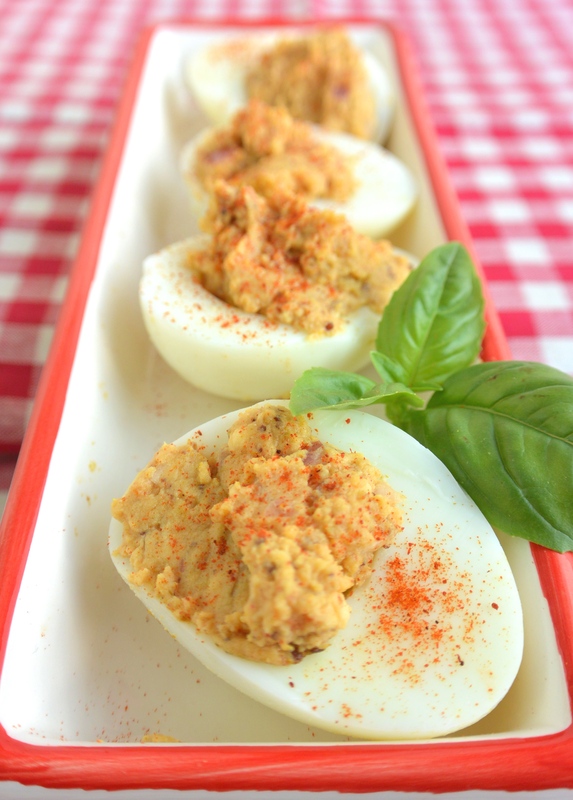 Finish it by scattering a little paprika powder over the deviled eggs. ps. if you don’t like raw onion you can fry them a little! Posted in recipes, SnacksTagged comfortfood, dairyfree, egg, eggs, fit, food, glutenfree, glutenvrij, healthy, healthy lifestyle, healthy snack, homemade, natural, recipe, snack, soyfree, sugarfree, suikervrij, zuivelvrijBookmark the permalink.